How do civilians control the military? In the wake of September 11, the renewed presence of national security in everyday life has made this question all the more pressing. 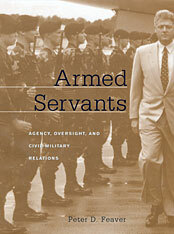 In this book, Peter Feaver proposes an ambitious new theory that treats civil–military relations as a principal–agent relationship, with the civilian executive monitoring the actions of military agents, the “armed servants” of the nation-state. Military obedience is not automatic but depends on strategic calculations of whether civilians will catch and punish misbehavior. This model challenges Samuel Huntington’s professionalism-based model of civil–military relations, and provides an innovative way of making sense of the U.S. Cold War and post–Cold War experience—especially the distinctively stormy civil–military relations of the Clinton era. In the decade after the Cold War ended, civilians and the military had a variety of run-ins over whether and how to use military force. These episodes, as interpreted by agency theory, contradict the conventional wisdom that civil–military relations matter only if there is risk of a coup. On the contrary, military professionalism does not by itself ensure unchallenged civilian authority. As Feaver argues, agency theory offers the best foundation for thinking about relations between military and civilian leaders, now and in the future.